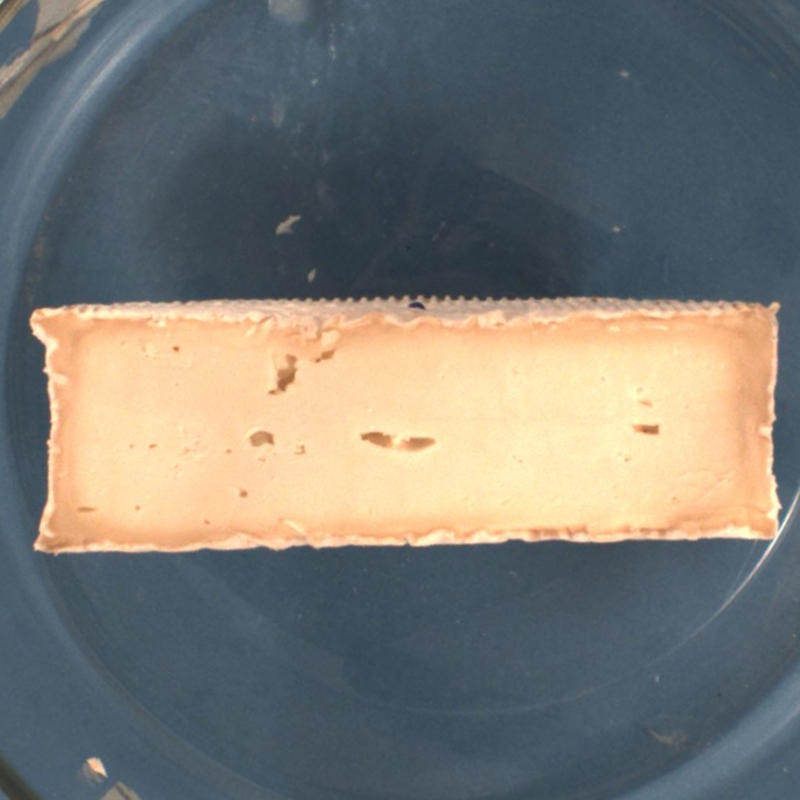 In order to make so-called "model cheeses", experimental procedures in laboratories use pasteurized milk inoculated with Kluyveromyces marxianus (Km), Geotrichum candidum (Gc), Penicillium camemberti (Pc) and Brevibacterium auriantiacum (Ba) under aseptic conditions. Phase 1 is characterized by the surface humidity evolution of cheese (drying process). At the beginning, the surface of cheese is very wet and evolves until it presents a rather dry aspect. The cheese is white with an odor of fresh cheese. 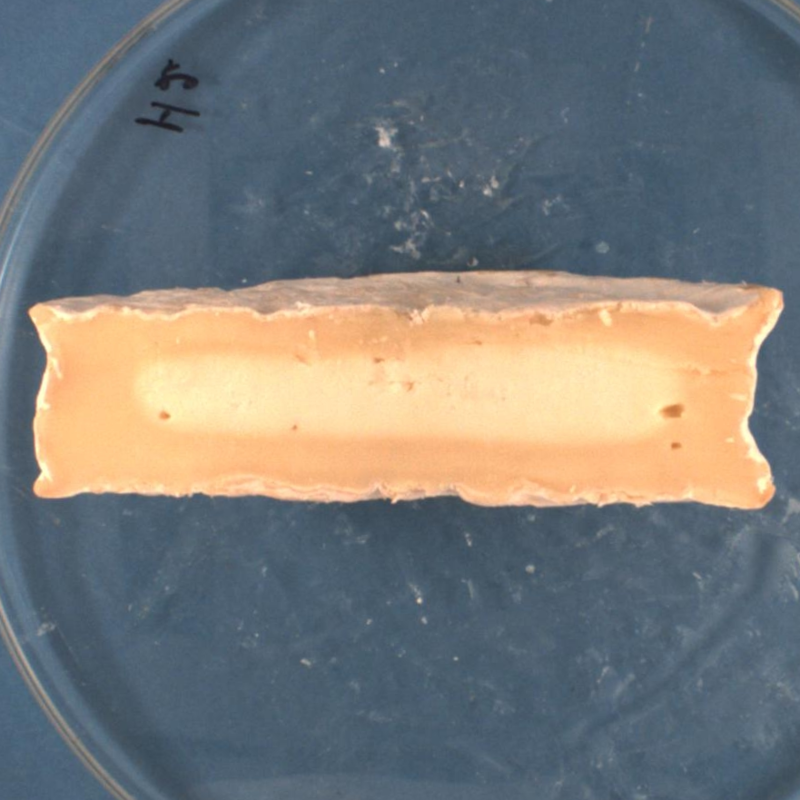 Phase 2 begins with the apparition of a P. camemberti coat (i.e the white-coat at the surface of cheese), it is characterized by a first change of color and a "mushroom" odor development. Phase 3 is characterized by the thickening of the creamy under-rind. 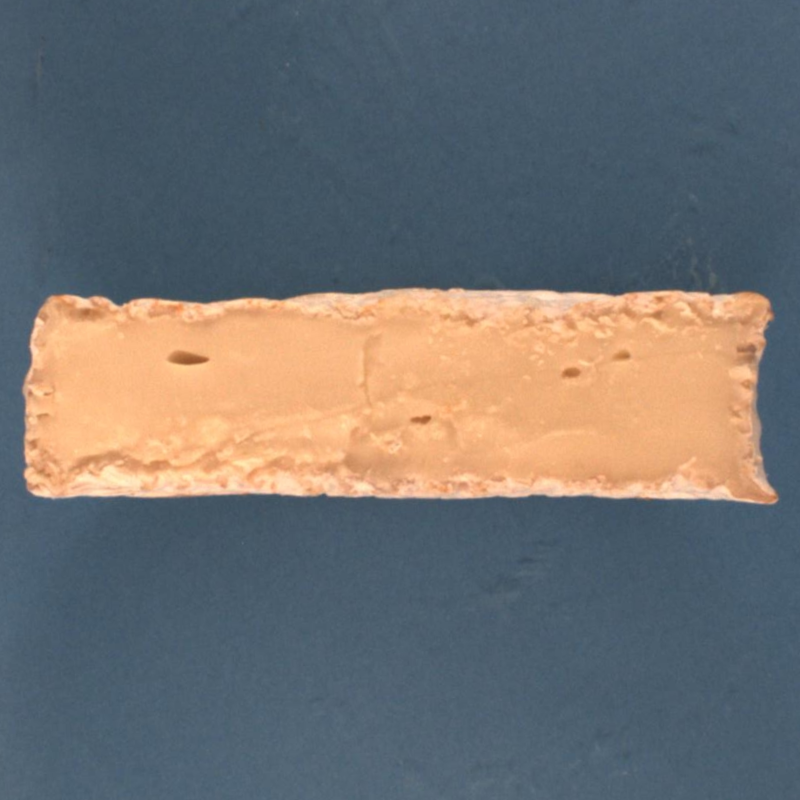 P. camemberti cover all the surface of cheeses and the color is light brown. 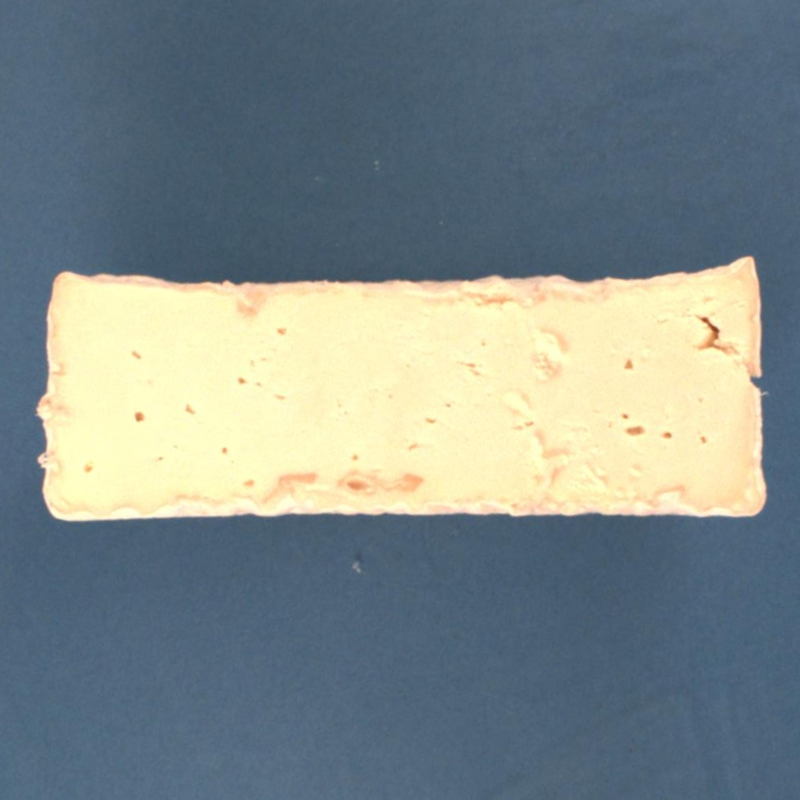 Phase 4 is defined by strong ammonia odor perception and the dark brown aspect of the rind of cheese. These four steps are representative of the main evolution of the cheese during ripening. The expert's knowledge is obviously not limited to these four phases, but they help to evaluate the whole dynamics of ripening and to detect drift from the standard evolution. Cooperative coevolution strategies rely on a formulation of the problem to be solved as a cooperative task, where individuals collaborate or compete in order to build a solution. They mimic the ability of natural populations to build solutions via a collective process. 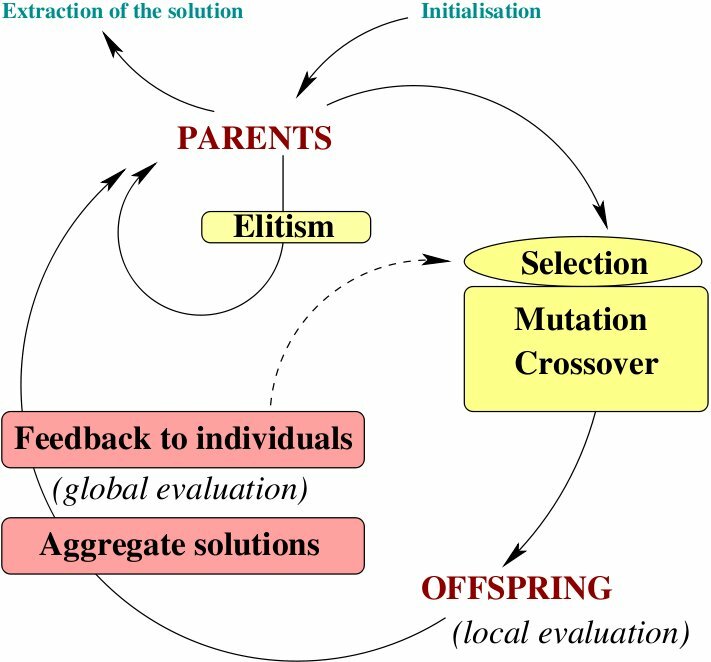 Instead of dealing with a coevolution process that happens between different separated populations, we use a different implementation of cooperative coevolution principles, called "Parisian approach", that uses cooperation mechanisms within a single population. It is based on a two-level representation of an optimization problem, in the sense that an individual of a Parisian population represents only a part of the solution to the problem. An aggregation of multiple individuals must be built in order to obtain a solution to the problem. In this way, the co-evolution of the whole population (or a major part of it) is favoured instead of the emergence of a single best individual, as in classical evolutionary schemes. Genetic Programming (GP) is a specialization of genetic algorithms where each individual is a function, represented as a tree structure. It is then easy to apply genetic operators to these trees in an evolutionary algorithm. GP is used here to search for a convenient formulas that estimate the phase at time t, knowing micro-organisms proportions at the same time t, but without a priori knowledge of the phase at the time t-1. In a first classical GP approach, the phase estimator is searched as a single best "monolithic" function and then we use a cooperative scheme to split the phase estimation into four combined (and simpler) "phase detectors". The fitness function, to be minimised, is made of a factor that measures the quality of the fitting on the learning set, plus a "parsimony" penalisation factor in order to minimize the size of the evolved structures in order to avoid bloat. It favours evolution of structures with 30 to 40 nodes. 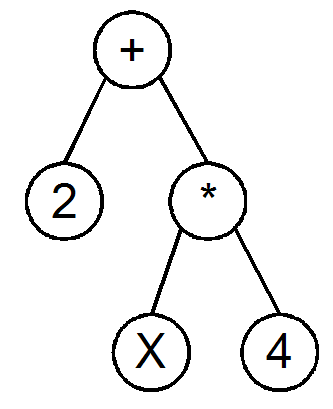 Moreover, it is divided by the number of variables involved in the evaluated tree in order to favour structures that embed all four variables of the problem. Instead of searching for a phase estimator as a single monolithic function, phase estimation can actually be split into four combined (and simpler) phase detection trees. The structures searched are binary output functions (or binarised functions) that characterize one of the four phases. 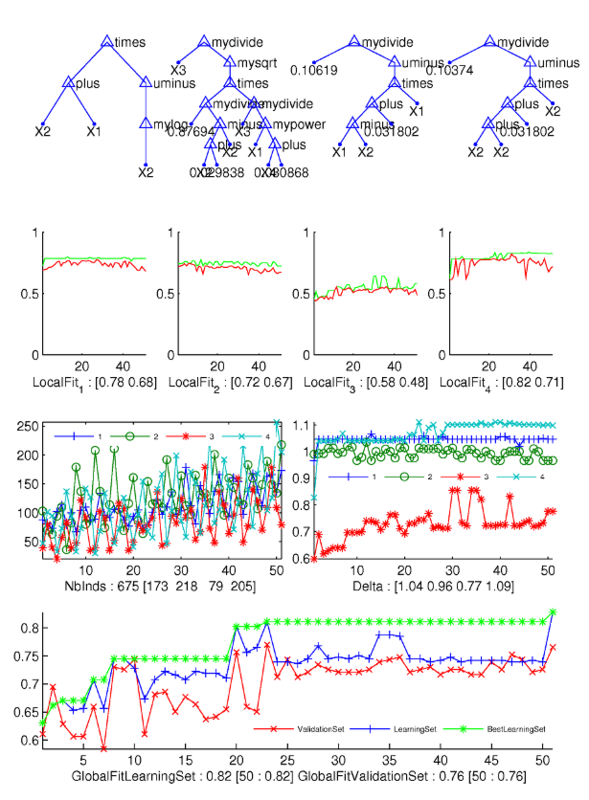 The population is then split into four classes such that individuals of class k are good at characterizing phase k. Finally, a global solution is made of at least one individual of each class, in order to be able to classify the sample into one of the four previous phases via a voting scheme. The first factor is aimed at characterising if individual I is able to distinguish one of the four phases, the second factor tends to balance the individuals between the four phases (#IndPhaseMax is the number of individuals representing the phase corresponding to the argmax of the first factor and #Ind is the total number of different individuals in the population) and the third factor is a parsimony factor in order to avoid large structures. 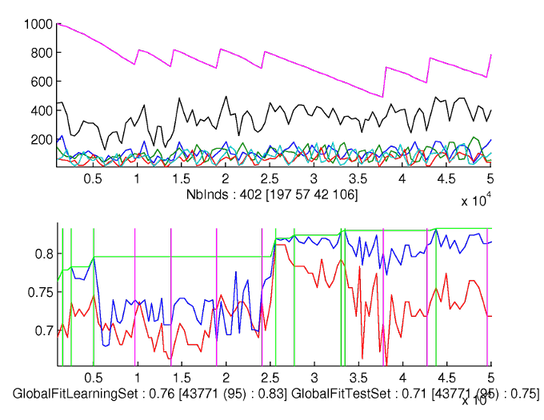 Available data have been collected from 16 experiments during 40 days each, yielding 575 valid measurements. It is to be noticed that collecting these experimental data was a long and difficult process, so these resulting data sets are often uncertain or even erroneous. For example, a complete cheese ripening process last 40 days, and some tests are destructive, i.e a sample cheese is consumed in the analysis. Other measurements require to grow bacterias in Petri dishes and then to count the number of colonies, which takes a lot of time. Experiments show that both GP outperform other available methods (multilinear regression and Bayesian network) in terms of recognition rates. Additionally the analysis of a typical Parisian GP run shows that much simpler structures are evolved: The average size of evolved structures is around 30 nodes for the classical GP approach and between 10 and 15 for the Parisian GP. Second line: the evolution with respect to generation number of the 5% best individuals for each phase: the upper curve of each of the four graphs is for the best individual, the lower curve is for the "worst of 5% best" individuals. Third line left: the distribution of individuals for each phase: the curves are very irregular but numbers of representatives of each phases are balanced. Third line right: discrimination indicator, which shows that the third phase is the most difficult to characterize. Fourth line: evolution of the recognition rates of learning and test set. The best-so-far recognition rate on learning set is tagged with a star. Despite of local elitism and bonus mechanisms, the global fitness is not a monotonically increasing function. In particular, it often happens that a generation notably improves the global fitness, while the generations that follow are not able to keep it. To avoid this undesirable effect, a variable sized population Parisian GP strategy is experimented, using adaptive deflating and inflating schemes for the population size. The idea is to group individuals with the same characteristics into "clusters" and remove the most useless ones at the end of every generation while periodically adding "fresh blood" to the population (i.e. new random individuals) if a stagnation criterion is fulfilled. Individuals having the same rawfitness are grouped into clusters. Then, inside each cluster, individuals are sorted according to their number of nodes. The first and best one is the one with the smallest number of nodes. 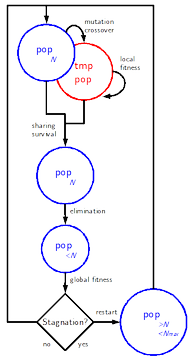 Useless individuals elimination allows to decrease the population size: An individual is considered as useless if it belongs to a big cluster and has a large number of nodes. The elimination rule depends on two parameters (tokeep and toremove): if a cluster has less than tokeep individuals, they are all kept, and if it has more, only the last toremove, having the largest number of nodes, are removed. In this way, if a cluster of the old population is empty or has not enough elements according to a stricter rule than during the elimination process, it gets new elements. With the deflating+inflating scheme, there are improvements of the global fitness all along the generations. The final recognition rate on the learning set is better than with the two other schemes. As far as the size of the population is concerned, one can observe the cycles of deflations and partial restart. The population is still quite balanced between the four classes, and the number of unique individuals is also quite stable. This first attempt to manage varying population sizes within a Parisian GP scheme show the effectiveness of the population deflation-inflation scheme in terms of computational gain and quality of results on a real problem. The deflating scheme allows to obtain the same result as the fixed-size population strategy, but using less fitness evaluations. The deflating-inflating strategy improves the quality of results for the same number of fitness evaluations as the fixed-size strategy. More generally, the deflation-inflation scheme has two major characteristics: a clusterisation-based redundancy pruning and a selective inflation, which tries to maintain limited-size clusters with low complexity individuals. These two concurrent mechanisms tends to better maintain low complexity individuals as well as genetic diversity. These characteristics may actually be transposed to classical GP or EAs, in particular to limit GP-bloat effects.